After visiting dozens of mansions, chateaus, and castles over the years rich-people’s palaces begin to look a little alike. They’re all different, of course, but large and extravagant homes don’t impress quite as much after you’ve seen so many of them. As a result, we’ve cut back on the number of houses we visit on our travels. 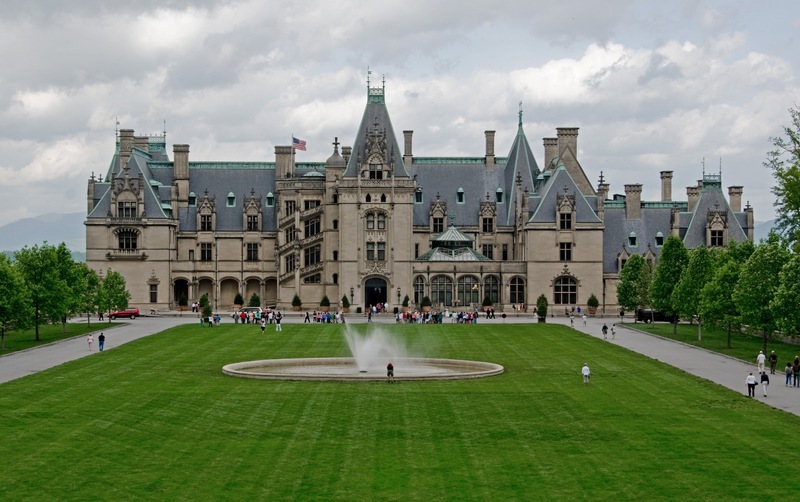 It’s been a long while since I’ve seen a house as impressive as the Biltmore Estate in Asheville, North Carolina. The largest private residence in the United States, it is as striking as any of the European castles or chateaus we’ve visited. A seven story banquet hall dominates the first floor. Its cavernous interior reminded me of the vaulted chambers more typical of a massive cathedral. Perhaps the similarity was intentional. After all, what better place to gather and worship at the alter of conspicuous consumption than in the largest dining hall in the largest home in the States? Moving to the upper floors of the home, it becomes clear that the ground floor, where guests were entertained, was definitely given priority. The entire upstairs seems to be built to accommodate the massive rooms below. In contrast to the main floor, where large open spaces dominate, rooms on the upper floors are often connected via long winding hall ways. The basement, meanwhile, is a huge subterranean city where the help labored in multiple kitchens and washrooms to manage the affairs above. An indoor pool, bowling alley, and an entire room dedicated to the motor needed to power the 700 pipe organ are also found in the basement labyrinth. Hello, It sounds like you are having a nice adventure. The Biltmore house is very impressive. My husband and I saw it while it was decorated for Christmas. Interesting. The Christmas decorations must have been over the top . . . maybe put the Rockefeller tree in the banquet hall. At the price they charge to see it it is no wonder.. right? It’s true. I’m not above bitching about admission prices and Biltmore is pretty cost prohibitive. It was one of those places we felt like we should see, so we sucked it up. It could just as easily have gone the other way. The funny thing is I recall being taken aback at the price of Chatsworth House (from our ‘About Us’ picture). But now I look and they’re charging £16. It’s possible they’ve cut prices since we were there in 2006 but for whatever reason, they’re now less than half what Biltmore costs. Maybe that’s a good reason to fly over to England.